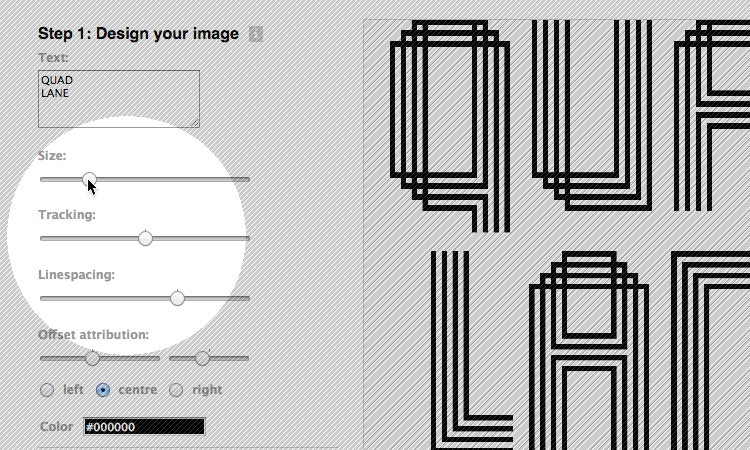 The FontStruct Maker is a simple tool for designing a high-resolution image with a FontStruction. There's no need to install a font, or any design software. 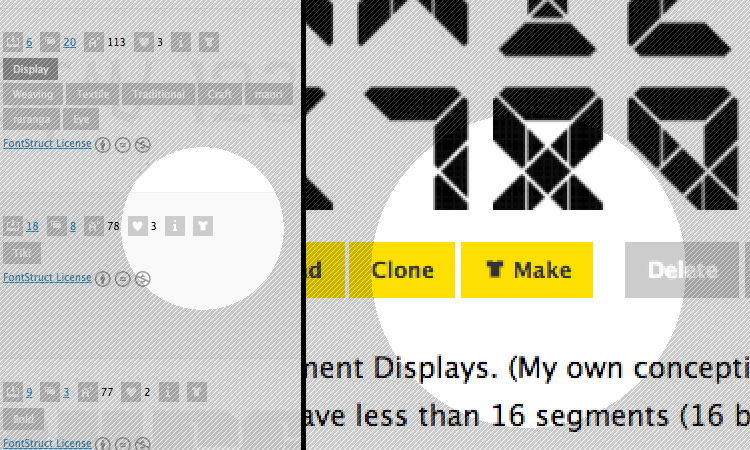 The FontStruct Maker is connected directly to Spreadshirt so you can design and order merchandise directly if you wish. We believe it’s the world’s most convenient and speediest type-to-tee system. 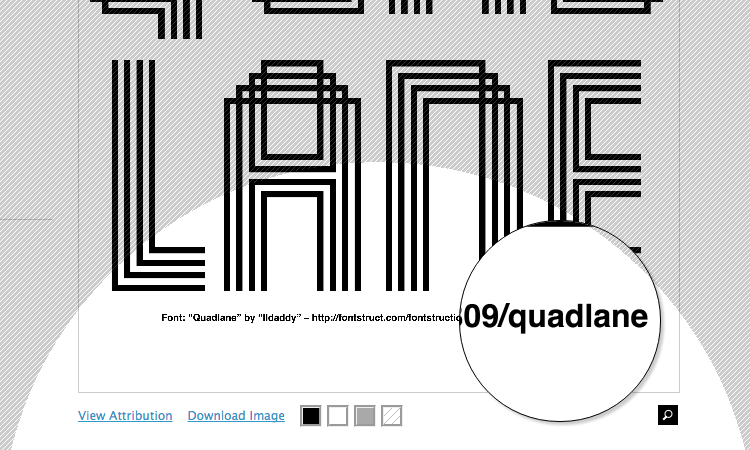 You can access the maker from any gallery page, or from a FontStruction homepage – just look for the t-shirt icon. 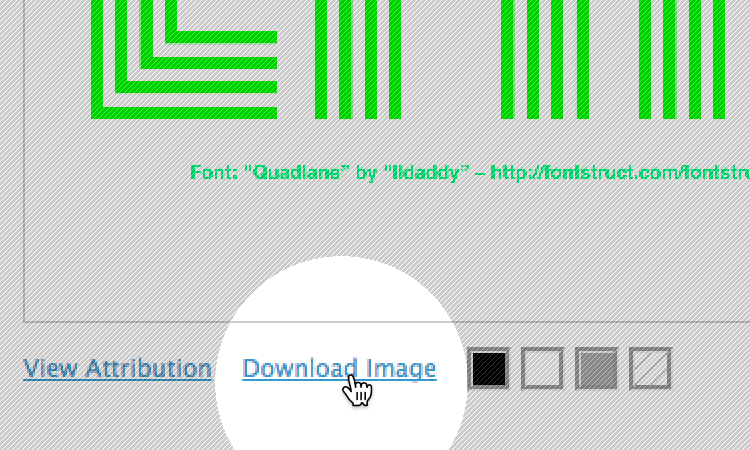 Note that you can use any FontStruction except those which have an “All Rights Reserved” license. Enter the text in the text entry area. You should see it previewed in the work area on the right. The text can be of any length - from a single glyph to a complete paragraph. Note that you have to enter linebreaks by hand – the text does not wrap automatically. Use the sliders to the left of the work area to adjust your text. You can adjust it’s size, tracking (letterspacing) and linespacing. When adjusting the font size, try and fill as much of the work area as is practical – the larger your text, the higher the resolution of your finished image and the higher the potential print quality. If your text is clipped on the left, or appears too low in the work area (this happens with some FontStructions) you can simply drag the whole thing around to position it as you desire. Most FontStructions are licensed with “copyleft” licenses which require anyone using them to credit the designer appropriately. The FontStruct maker provides this credit, or attribution, automatically in the form of a single line of text, set in a sans-serif font (Helvetica or Arial depending on your system) at a small point size. If you are using the Maker with one of your own FontStructions or one with a free, public domain license, you have the option to include the attribution line, but don’t need to. You can adjust the position of the attribution line using the relevant sliders, and you can check it’s contents either using the magnifying glass tool found underneath the work area, or by hovering with the mouse over the “View Attribution” link. 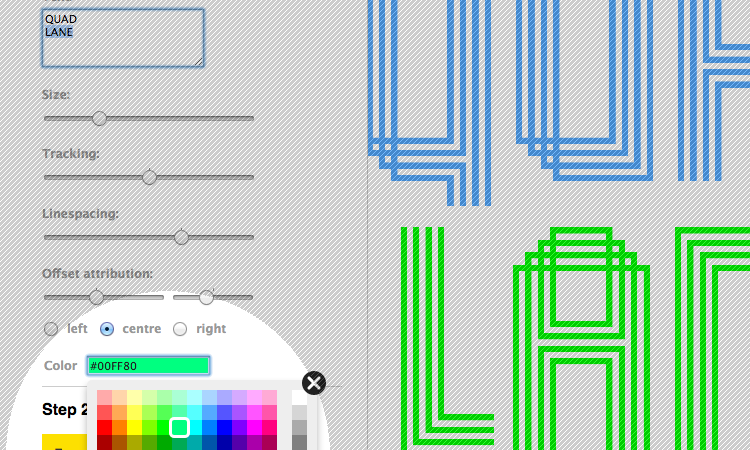 Use the colour picker to choose a colour for your text. It is quite possible to use multiple colours but this feature is at an experimental stage. It does work, but if you try and edit the text after applying colour for example, you will see that things can get confusing. - Please note, you will always see when something goes wrong here - the image you see in the workarea is a scaled-down version of the image which will be output from the Maker, so it’s perfectly safe to try and use multiple colours. It’s just a question of a slightly uncomfortable interface. To use multiple colours, first select a default colour. This should be the colour you’d like the attribution line to have. Then, in the text entry box, select the letters which you’d like to colour differently and choose the relevant colour with the colour picker. You can do this as many times as you want. You can use the swatches below the area to set a different background preview colour. Note that the image you create will always have a completely transparent background - this background colour is only there to make it easier to see what you’re doing. Next to the swatches there's also a “Download Image” button which you can use to download exactly the image which will be sent to Spreadshirt should you choose to print with them. You don’t need to use this button but we would strongly recommend doing so - so you can have a good close look at your image – the colours, the font size, the attribution line – and look out for things that need to be adjusted (for example any cropping, undesirable overlaps or a misalignment of the attribution line). Choose the shop nearest to you. 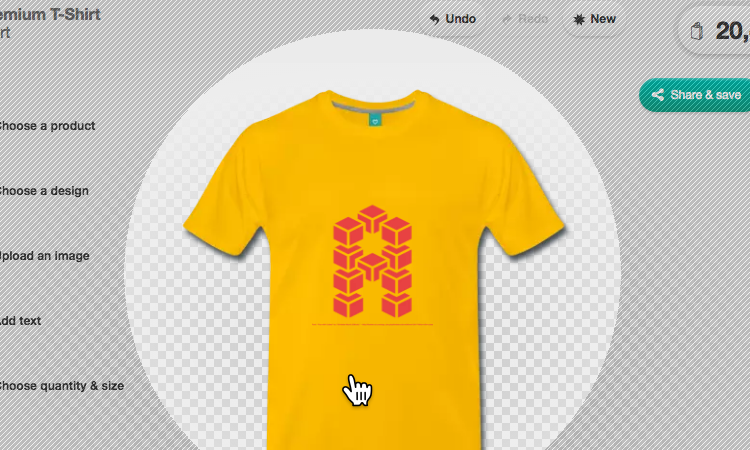 You’ll have to wait for a few seconds while your image is prepared and uploaded to Spreadshirt, and while the Spreadshirt designer (they call it the “Tablomat”) opens. Note that when you use the Tablomat and when you order anything, you are using the Spreadshirt website and purchasing from Spreadshirt. FontStruct only provides you with the tool for designing the images, while the printing and the shop itself are both in Spreadshirt’s domain. So any help and support you need regarding this part of the process should be provided by Spreadshirt. You can use most of the products in the Spreadshirt catalogue with the output from the FontStruct Maker, but a few products can’t be printed upon using the image format we provide – the Tablomat will inform you if this is the case. If you want to print onto multiple surfaces of a product (i.e. the front and back of a T-Shirt) you’ll have to upload images by hand - the Tablomat allows you do this. 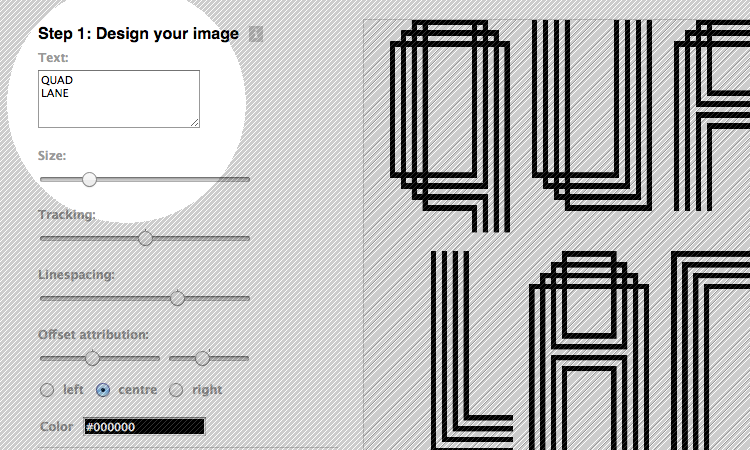 Here's a video introduction to the FontStruct Maker.